This article is about the film. For other uses, see Jurassic Park III (disambiguation). "JP3" redirects here. It is not to be confused with JP-3. Jurassic Park III is a 2001 American science fiction adventure film and the third installment in the Jurassic Park film series. The film stars Sam Neill, William H. Macy, Téa Leoni, Alessandro Nivola, Trevor Morgan, and Michael Jeter. It is the first film in the series Steven Spielberg did not direct; neither was it based on a book by Michael Crichton, although numerous scenes in the film were taken from Crichton's novels Jurassic Park and The Lost World. Events depicted in the film take place on Isla Sorna, an island off Central America's Pacific coast, where a divorced couple have tricked Dr. Alan Grant into helping them find their son. After the success of Spielberg's film Jurassic Park, Joe Johnston expressed interest in directing a sequel. Spielberg gave Johnston permission to direct a third film in the series, if there was to be one. Production of Jurassic Park III began on August 30, 2000. Despite mixed reviews from critics, the film was successful at the box office, grossing $368 million worldwide. A sequel, Jurassic World, was released on June 12, 2015. Ben Hildebrand and 12-year-old Eric Kirby go parasailing, tethered to a boat, in the waters around Isla Sorna. The boat's crew mysteriously disappears, forcing Ben to detach the line. He and Eric drift towards the island. In the United States, paleontologist and Jurassic Park survivor Dr. Alan Grant has made a new discovery about the intelligence of Velociraptors, but struggles to secure funding for his research because of an incident at San Diego that has revealed the existence of the de-extinct dinosaurs. Grant discusses his discovery of a resonating larynx on fossilized raptor remains with his former lover and colleague Dr. Ellie Sattler. This, and his experience at Jurassic Park, leads him to believe the original Velociraptors were socially sophisticated. He hypothesizes that if they had not gone extinct and continued to evolve, their descendants—rather than humans—would have become Earth's dominant species. His assistant Billy Brennan uses a 3D printer to replicate the Velociraptor larynx. Paul and Amanda Kirby offer funding for Grant's research if he will fly them around Isla Sorna. Grant reluctantly agrees and flies there with Paul, Amanda, Billy, and the Kirbys' mercenary associates Udesky, Cooper, and their pilot Nash. During the flight, Grant learns that the Kirbys plan to land on the island; he protests but Cooper knocks him unconscious. Grant awakens to discover they have landed. A Spinosaurus approaches the group, who board the plane to escape without Cooper. The Spinosaurus devours Cooper on the runway and the plane crashes into the forest. The Spinosaurus destroys the plane, killing Nash. Fleeing, the survivors briefly lose the Spinosaurus but encounter a Tyrannosaurus rex. The Spinosaurus returns but the group escapes while the two dinosaurs fight. The Spinosaurus breaks the T. rex's neck. Grant learns the Kirbys are a middle-class, divorced couple who are looking for their son Eric and Amanda's boyfriend Ben, who are missing on the island. The group finds the parasail attached to Ben's corpse. They take the parasail and then encounter raptor nests, and find an abandoned InGen compound. A raptor chases them and summons the rest of its pack. The humans flee into a herd of Corythosaurus and Parasaurolophus, causing a stampede, and separating Grant and Udesky from the others. Raptors attack Udesky in an attempt to lure the others out of a tree. The raptors almost kill Amanda when she tries to descend to help Udesky. The raptors' trap fails and they kill Udesky before departing. Elsewhere, Grant watches the raptors communicating and suspects they are searching for something. They corner him but is rescued by Eric, who survives in an overturned water truck. The next day, Grant and Eric hear Paul's satellite telephone ringing, and are reunited with Billy and the Kirbys. The group is then chased by the Spinosaurus that killed Nash. After the group escapes, Grant discovers Billy has taken two raptor eggs to use for funding, which provoked the raptor attacks. Grant decides to keep the eggs to ensure the group's survival. The group unknowingly enters a large aviary used to house Pteranodons, which attack the group and fly away with Eric. Billy rescues Eric using Ben's parasail, but is then attacked and apparently killed by the Pteranodons. The rest of the group escapes the aviary, leaving the door unlocked. They find a boat and make their way down a river. That night, the group retrieves the ringing telephone, which is buried in the feces of the Spinosaurus. Grant tries to contact Sattler but the Spinosaurus attacks the boat. Grant ignites the boat's fuel and burns the Spinosaurus, causing it to flee. The next day, the group makes its way towards the coast but are surrounded by the raptors. They surrender the eggs to the raptors while Grant uses the replica raptor larynx to confuse the pack, which runs off with the eggs. The group reach the coast and find that Sattler had called in the U.S. Marine Corps and the U.S. Navy to rescue them. They discover that Billy, while seriously injured, is still alive and has also been rescued. As they leave the island, they see the Pteranodons flying free. In a deviation from the previous films, the Spinosaurus is considered the primary antagonist;[dead link] Johnston stated, "A lot of dinosaurs have a very similar silhouette to the T-Rex ... and we wanted the audience to instantly recognize this as something else". 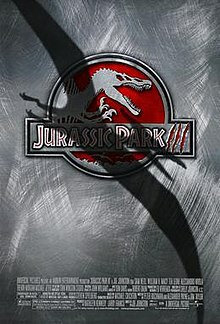 The silhouette of the Spinosaurus is shown behind that of the Pteranodon on the film's promotional poster, taking the place of the Tyrannosaurus that had been used in the previous films' posters. Baryonyx was originally considered to be the "big bad" before Spinosaurus was chosen, and early concept posters reflected this. Within the film's dialogue, Billy interprets the animal he encounters as a Baryonyx or a Suchomimus, but Dr. Grant corrects his analysis based on its size and its sail. Because of new discoveries and theories in the field of paleontology, several dinosaurs are portrayed differently in this film than in previous ones. Discoveries suggesting Velociraptor were feathered prompted the addition of quill-like structures on the head and neck of the males in the film. "We've found evidence that Velociraptors had feathers, or feather-like structures, and we've incorporated that into the new look of the raptor", said paleontologist Jack Horner, the film's technical adviser. Joe Johnston had been interested in directing the sequel to Jurassic Park; he approached Spielberg, a friend of his, about the project. While Spielberg wanted to direct the first sequel, he agreed Johnston could direct a possible third film. The second film, entitled The Lost World: Jurassic Park, includes a scene showing a Tyrannosaurus rampaging through San Diego; Spielberg had intended to use this scene for a third film but later decided to add it into the second film after realizing he probably would not direct another film in the series. After the release of the second film in May 1997, Spielberg was busy with other projects; when asked about the possibility of a third Jurassic Park film, he responded, "It would give me a tremendous ... headache just to think about it". Universal Pictures announced the film on June 29, 1998, with Spielberg as a producer. Michael Crichton was reportedly going to collaborate with Spielberg to create a storyline and write a script. The film was set for release in mid-2000. Spielberg initially devised a story involving Dr. Alan Grant, who was discovered to have been living on one of InGen's islands. According to Johnston, "He'd snuck in, after not being allowed in to research the dinosaurs, and was living in a tree like Robinson Crusoe. But I couldn't imagine this guy wanting to get back on any island that had dinosaurs in it after the first movie." In June 1999, Craig Rosenberg began writing the first draft of the script, which involved teenagers becoming marooned on Isla Sorna. Johnston was announced as the film's director in August 1999, with Rosenberg still attached. Production was expected to begin in early 2000. Rosenberg's draft about teenagers on Isla Sorna was rejected in September 1999. According to Johnston it was "not a badly written script"; he also said, "It read like a bad episode of Friends". By December 1999, new writers had been hired to devise a better story for the film. The film's second script involved a Pteranodon escaping from Isla Sorna and causing a spate of mysterious killings on the mainland, which was to be investigated by Alan Grant and other characters including Billy Brennan, a naturalist named Simone, a tough military attaché, and wealthy Paul Roby and his teenage son Miles. Grant's group crash-lands on the island while a parallel investigation is done on the mainland. The aviary sequence and laboratory set piece were initially much longer and more complex, and included a Velociraptor stealthily entering a hatchery where the team spends the night. Sets, costumes, and props were built for this script. In February 2000, filming was reportedly set to begin in Fiordland, New Zealand, around the end of the month. Scenes were originally planned to be filmed there for The Lost World: Jurassic Park. In March 2000, Maui, Hawaii, was reportedly chosen instead of New Zealand. Sam Neill signed to the project in June 2000; the 18-week filming schedule was expected to begin by August that year, with a projected release in July 2001. Macy originally turned down his role due to scheduling conflicts. Trevor Morgan and Téa Leoni were cast in August 2000. Utah's Dinosaur National Monument and a military base at Oahu were being considered as filming locations. During the pre-production phase, concept artists created advertising for the film using a working titles including Jurassic Park: Extinction and Jurassic Park: Breakout. Five weeks before filming began, Johnston and Spielberg rejected the entire script because they were dissatisfied with it; $18 million had already been spent on the film. Johnston felt the script's story was too complicated. The simpler "rescue mission" plot, which had been suggested by David Koepp, was used for the film instead. Alexander Payne and Jim Taylor began rewriting the script in July 2000. Johnston said the script was never finished during production: "We shot pages that eventually went into the final script but we didn't have a document". Principal photography began on August 30, 2000, at Dillingham Airfield in Mokulēia, Hawaii. Macy, commenting on the slow pace of filming the script, said "we would do a quarter-page–some days, an eighth of a page. And that would be a full 12-hour day." Filming continued on Oahu until September 9. Aerial footage of Molokai's North Shore cliffs was then filmed over the next two days, which was followed by a week of filming in Kauai. Filming in Hawaii concluded on September 20, 2000. Production then moved to California; John August was hired to do uncredited work on the script in September 2000. Scenes were filmed at Occidental College in Los Angeles on October 10, 2000. Scenes were filmed at Center Bay Studios in Los Angeles at the end of October. Other filming locations in California included South Pasadena and a rock quarry in Irwindale. Filming also took place at Universal Studios' backlot in Los Angeles. Production returned to Hawaii in January 2001 to film the movie's ending, which had not be written at the time of the previous Hawaiian shoot. The ending was filmed on Kauai's Pila'a Beach. The storyline contains minor scenes taken from Crichton's novels Jurassic Park and The Lost World, such as the Pteranodon aviary and the use of a boat, that did not appear in these books' film adaptations. Laura Dern's cameo was filmed in a day. In an earlier draft, Neill's and Dern's characters were a couple in the process of splitting up. Johnston said, "I didn't want to see them as a couple anymore. For one thing, I don't think they look like a couple. It would be uncomfortable to still see them together. And Laura Dern doesn't look like she's aged for the past fifteen years!" The film's longest rough cut without credits was approximately 96 minutes long. According to Johnston, "We lost maybe 8 minutes, so it was never really that long". Composer John Williams was busy writing the music for Spielberg's film A.I. Artificial Intelligence; he recommended Don Davis to write the Jurassic Park III score. Williams' original themes and several new ones—such as one for the Spinosaurus that focused on low sounds, with tubas, trombones, and timpani—were integrated into the score. The fight between the Spinosaurus and the Tyrannosaurus, which Davis compared to King Kong's fight with dinosaur in the 1933 film, juxtaposes the Spinosaurus theme with the one Williams wrote for the T. rex. In addition, "Big Hat, No Cattle", a song by Randy Newman, was used in a restaurant scene. Jurassic Park III premiered at the Universal Amphitheater in Los Angeles, California, on July 16, 2001; two days later the film was released in the United States and other countries. The film earned $181,171,875 in the United States and $368,780,809 worldwide, making it the eighth-highest-grossing film of the year worldwide. But it is the lowest-grossing Jurassic Park film in the entire series. The soundtrack was released in July 2001. The film was released on VHS and DVD on December 11, 2001. It was re-released with both sequels in December 2001 as the Jurassic Park Trilogy, and as the Jurassic Park Adventure Pack in November 2005. It has also been released as a two-disc DVD set alongside Hulk. In 2011, the film was released on Blu-ray as part of the Jurassic Park: Ultimate Trilogy Blu-ray collection. Jurassic Park III is also included in the Jurassic Park 4K UHD Blu-Ray collection, which was released on May 22, 2018. Jurassic Park III has received mixed reviews from critics. Rotten Tomatoes gives the film a 50% rating based on 163 reviews, with an average rating of 5.2/10. The site's consensus states; "Jurassic Park III is darker and faster than its predecessors, but that doesn't quite compensate for the franchise's continuing creative decline." It has a score of 42 out of 100 on Metacritic, indicating "mixed or average reviews". On both sites, it is the lowest-rated film of the Jurassic Park franchise. Entertainment Weekly's Owen Gleiberman, who praised the previous Jurassic Park films, awarded the third film a C grade, writing "Jurassic Park III has no pretensions to be anything more than a goose-bumpy fantasy theme-park ride for kids, but it's such a routine ride. Spielberg's wizardry is gone, and his balletic light touch as well, and that gives too much of this 90-minute movie over to the duller-than-dull characters." Derek Elley of Variety Reviews called the film "an all-action, helter-skelter, don't-forget-to-buy-the-computer-game ride that makes the two previous installments look like models of classic filmmaking". Ben Varkontine of PopMatters called it "not as good a ride as the first, but a damn sight better than the second". Much of the criticism was leveled at the plot as being simply a chase movie with no character development; Apollo Movie Guide panned the film as being "almost the same as the first movie" with "no need for new ideas or even a script". Empire magazine gave the film 3 stars out of 5, calling it "short, scrappy and intermittently scary". On Ebert and Roeper, Richard Roeper gave it a Thumbs Down while Roger Ebert awarded a Thumbs Up. In a subsequent review, Ebert called it "the best blockbuster of the Summer". In his review, Ebert gave the film three stars and said it "is not as awe-inspiring as the first film or as elaborate as the second, but in its own B-movie way it's a nice little thrill machine". He also wrote, "I can't praise it for its art, but I must not neglect its craft, and on that basis I recommend it". Paleontologist Robert T. Bakker, an early pioneer of the dinosaur-bird connection, said the feather quills added to the Velociraptor for Jurassic Park III "looked like a roadrunner's toupee", but conceded that feathers are difficult subjects for computer animation and speculated that Jurassic Park IV's raptors would have more realistic with plumage. In 2002, Crichton said he had not watched the film. A teaser trailer was released online in September 2000. Universal avoided excessive early marketing to prevent a possible backlash; the studio believed awareness of the film was already sufficient. Marketing began in April 2001, three months before the film's release. The first footage from the film was aired during the second-season finale of Survivor in May 2001. Promotional partners included Kodak and The Coca-Cola Company. No fast-food promotions took place in the United States, although children's meal toys based on the film were offered in Canadian Burger King outlets. Seven video games were released to coincide with the film, and a novelization by Scott Ciencin that was aimed at young children was published. Ciencin also wrote three children's books to tie in with the film's events: Jurassic Park Adventures: Survivor, the first book, detailed the eight weeks Eric spent alone on Isla Sorna; Jurassic Park Adventures: Prey had Eric and Alan returning to Isla Sorna to rescue a group of teenage filmmakers; and Jurassic Park Adventures: Flyers involved Eric and Alan leading the Pteranodon home after they nest in a Universal Studios theme park. In early 2001, Hasbro released a line of 3¾-inch action figures including electronic dinosaurs, humans, and vehicles, to coincide with the film's release. The figures were scaled down from the original Kenner action figures from the pre-Jurassic Park III toy lines. A line of toys were also released through the Lego Studios brand. Playskool released a line of toys called Jurassic Park Junior, which were aimed at young children. A smaller line of die-cast toys and a range of clothes were also produced. In November 2001, to promote the film's impending home media release, Universal launched a viral marketing website for Isla Travel, a fictional Isla Sorna travel agency. For the film's home media release, Universal partnered with cell-phone company Hop-On to produce "the world's first disposable cell phone", which would have been available through an in-package offer upon purchase of the film. The telephones were to be delivered free to customers who responded to a winning promotional card that was supplied with selected copies of the film. Approximately 5,000 copies of the film contained a winning promotional card; approximately 1,000 of them were redeemed. The promotion was canceled because the handsets could not be finished on time. An investigation by the San Francisco Chronicle revealed that sample versions of Hop-On's cell phones were actually modified Nokia handsets; Hop-On was having problems with its own design. Customers who were to receive the cell phones received a $30 check and a free DVD instead. ^ "Jurassic Park III". British Board of Film Classification. Retrieved April 4, 2013. ^ a b c "Jurassic Park III (2001)". Box Office Mojo. Retrieved March 5, 2009. ^ a b "Production Notes". Cinema Review. Retrieved July 16, 2008. ^ a b c d e The Making of Jurassic Park III (DVD)|format= requires |url= (help). Universal Pictures. 2005. ^ "Jurassic Park 3: Production Notes". Cinema.com. Retrieved June 3, 2016. ^ a b c "Johnston on Underwater Dinos, Spielberg's JP3 Idea". DansJP3Page.com. Movieline. June 10, 2001. Archived from the original on June 28, 2001. ^ Archerd, Army (May 28, 1997). "Spielberg adds joke to Japanese 'World'". Variety. Retrieved November 12, 2015. ^ Cox, Dan (June 30, 1998). "'Jurassic 3′ slated by U; Spielberg, Crichton to pen pic". Variety. Retrieved November 10, 2014. ^ Petrikin, Chris (August 5, 1999). "Johnston to direct third U pic". Variety. Retrieved November 10, 2014. ^ "Spielberg dodges directing 'Jurassic 3'". CNN. Archived from the original on December 6, 2006. Retrieved July 16, 2008. ^ a b c d e f g h i "Evolution of the dinos - Ten questions with Joe Johnston". DVDFile.com. p. 1–2. Archived from the original on January 3, 2002. ^ "JURASSIC PARK 3.... some news and some musings..." Aint-It-Cool-News.com. February 1, 2000. Archived from the original on March 3, 2000. ^ "Further Information On JURASSIC PARK 3". Aint-It-Cool-News.com. February 2, 2000. Archived from the original on March 4, 2000. ^ "Scene Is Set For 'Jurassic Park' Sequel". Sun-Sentinel. October 25, 1996. Retrieved November 10, 2014. ^ Head, Steve (March 29, 2000). "Location News & Trailer Rumor". IGN.com. Retrieved November 10, 2014. ^ McNary, Dave (June 28, 2000). "Neill to reprise 'Jurassic' role; Third installment to begin shooting July/Aug". Variety. Retrieved November 10, 2014. ^ a b Brake, Scott (July 20, 2000). "Rewrites and New Casting For Jurassic Park 3". IGN.com. Retrieved November 10, 2014. ^ Head, Steve (August 9, 2000). "Jurassic Park 3, The Casting Continues". IGN.com. Retrieved November 10, 2014. ^ Head, Steve (August 16, 2000). "Jurassic Park 3 and the Dinosaur Quarry". IGN.com. Retrieved November 10, 2014. ^ Head, Steve (August 7, 2000). "Jurassic Park 3 Seeks Military Base". IGN.com. Retrieved November 10, 2014. ^ Jurassic Park III (DVD). 2001. ^ Masters, Kim (January 30, 2013). "Lucasfilm's Kathleen Kennedy on 'Star Wars,' 'Lincoln' and Secret J.J. Abrams Meetings (Exclusive)". The Hollywood Reporter. Archived from the original on March 9, 2015. ^ a b Ryan, Tim (August 25, 2000). "Cameras roll soon for Jurassic Park III". Honolulu Star-Bulletin. Archived from the original on October 18, 2000. ^ Tobias, Scott (May 30, 2001). "William H. Macy interview". The A.V. Club. Archived from the original on June 5, 2001. ^ a b Kieszkowski, Elizabeth (September 2, 2000). "Media gain access to 'Jurassic Park III' set". The Honolulu Advertiser. Archived from the original on October 18, 2000. ^ K. Kakesako, Gregg (September 4, 2000). "Film producers catch aloha spirit". Honolulu Star-Bulletin. Archived from the original on June 25, 2001. ^ Head, Steve (September 21, 2000). "Flying Dinos for Jurassic Park 3?". IGN.com. Retrieved November 10, 2014. ^ a b Head, Steve (October 24, 2000). "Jurassic Park 3 on the Studio Backlot". IGN.com. Retrieved November 10, 2014. ^ Head, Steve (October 31, 2000). "Jurassic Park 3 at Center Bay Studios". IGN.com. Retrieved November 10, 2014. ^ "Jurassic Park III production notes: Dinos Everywhere". CinemaReview.com. Retrieved November 10, 2014. ^ Pearlman, Cindy (July 17, 2001). "New dinosaur is bigger and badder". Chicago Sun-Times. Archived from the original on July 19, 2001. ^ The Sounds of Jurassic Park III. Jurassic Park III Blu-Ray: Universal Home Video. ^ Plume, Kenneth (July 25, 2001). "Composer Don Davis Talks Jurassic Park III and the Matrix Sequels". IGN. Retrieved July 27, 2011. ^ Head, Steve (July 10, 2001). "Jurassic Park III's West Coast Premiere". IGN. Retrieved November 13, 2015. ^ "Jurassic Park III soundtrack valued at $12.99". Soundtrack.net. Retrieved May 17, 2007. ^ "Jurassic Park III". IGN. December 12, 2001. Retrieved July 9, 2007. ^ "Jurassic Park Trilogy". IGN. Retrieved March 6, 2007. ^ "Jurassic Park Adventure Pack". IGN. November 17, 2005. Retrieved March 6, 2007. ^ "Jurassic Park III released with Hulk". Amazon.com. Retrieved March 6, 2007. ^ "High Def Digest | Blu-ray and Games News and Reviews in High Definition". ultrahd.highdefdigest.com. Archived from the original on May 23, 2018. Retrieved May 22, 2018. ^ "Jurassic Park III". Rotten Tomatoes. Retrieved December 4, 2018. ^ "Jurassic Park III: Reviews". Metacritic. Retrieved May 15, 2007. ^ "News Review: Jurassic Park III". Entertainment Weekly. August 9, 2006. ^ Elley, Derek (July 17, 2001). "Jurassic Park III". Variety. ^ Varkontine, Ben. "Jurassic Park III". PopMatters. Archived from the original on September 3, 2007. Retrieved July 8, 2007. ^ Webster, Brian. "Jurassic Park III". Apollo Movie Guide. Archived from the original on September 27, 2007. Retrieved July 8, 2007. ^ "Review of Jurassic Park 3". EmpireOnline. ^ Ebert, Roger (July 18, 2001). "Jurassic Park 3 review". Chicago Sun-Times. Archived from the original on September 12, 2001. Retrieved October 14, 2014. ^ Bakker, R. 2004. "Dinosaurs Acting Like Birds, and Vice Versa – An Homage to the Reverend Edward Hitchcock, First Director of the Massachusetts Geological Survey" in Feathered Dragons. Currie, P.; Koppelhus, E.; Shugar, M.; Wright J. eds. Bloomington: Indiana University Press. pp. 1-11. ^ "Top Film, TV, Cable Composers Honored at BMI's Annual Film/TV Awards". Broadcast Music Incorporated. Archived from the original on October 18, 2017. Retrieved August 9, 2018. ^ Armstrong, Mark (February 11, 2002). "Razzies Get 'Fingered'". E! Online. Archived from the original on August 9, 2018. Retrieved August 9, 2018. ^ Hobbs, John (February 10, 2002). "Sound editors tap noms for Golden Reel Awards". Variety. Archived from the original on October 2, 2017. Retrieved August 9, 2018. ^ "WINNERS AND NOMINEES". Golden Trailer Awards. Archived from the original on March 7, 2012. Retrieved June 23, 2011. ^ Berkshire, Geoff (December 17, 2001). "'Moulin Rouge' in orbit, topping Satellite noms". Variety. Archived from the original on July 6, 2018. Retrieved August 9, 2018. ^ "Nominees for 28th Annual Saturn Awards". United Press International. March 14, 2002. Archived from the original on October 2, 2017. Retrieved August 9, 2018. ^ "2001 24th Hastings Bad Cinema Society Stinkers Awards". Stinkers Bad Movie Awards. Archived from the original on August 15, 2007. Retrieved March 30, 2013. ^ Head, Steve (September 11, 2000). "Jurassic Park 3 Teaser Trailer Online". IGN.com. Retrieved November 6, 2014. ^ a b Rose, Marla Matzer (May 25, 2001). "Studios taking cautious tack in marketing". Yahoo!. Archived from the original on June 12, 2001. ^ "Behind the Scenes of Jurassic Park 3". Digital Media FX. April 8, 2001. Archived from the original on April 20, 2001. ^ "First Jurassic Park III TV Spot Right Here, Baby!!!". AintItCool.com. May 3, 2001. Retrieved November 12, 2015. ^ "Kodak - Jurassic Park 3 Partner". CountingDown.com. April 2, 2001. Archived from the original on April 11, 2001. ^ "Coke announces in-theater tie-in". CountingDown.com. March 26, 2001. Archived from the original on April 11, 2001. ^ "Burger King confirmed for fast food promotion!". CountingDown.com. May 20, 2001. Archived from the original on June 28, 2001. ^ "Jurassic Park Licensees". Moby Games. Retrieved July 6, 2007. ^ Ciencin, Scott (2001). Jurassic Park III. Random House Books for Young Readers. p. 116. ISBN 978-0-375-81318-4. ^ Ciencin, Scott (June 2001). Survivor. Boxtree. p. 116. ISBN 0-7522-1978-2. ^ Scott Ciencin (October 2001). Prey. Boxtree. p. 123. ISBN 0-375-81290-3. ^ Ciencin, Scott (March 2002). Flyers. Boxtree. p. 128. ISBN 0-375-81291-1. ^ a b "Jurassic Park 3". JPToys.com. Retrieved November 13, 2015. ^ Lipkowitz, Daniel (2001). "Hasbro: Jurassic Park III". Altered States Magazine. Archived from the original on February 22, 2001. ^ Lipkowitz, Daniel (2001). "LEGO: Jurassic Park III, Mindstorms". Altered States Magazine. Archived from the original on February 22, 2001. ^ "The LEGO Company and Universal Studios Consumer Products Group Announce New Toys Based on Jurassic Park III". The Free Library. February 5, 2001. Retrieved November 13, 2015. ^ Keier, Helen (February 15, 2001). "Toy Fair Day 3 – Part 2: Jurassic Park 3, Lord of the Rings, Star Wars & More!". IGN. Archived from the original on February 18, 2001. ^ "Dinosaurs even the smallest kids will love". ToyNerd.com. June 18, 2013. Archived from the original on November 17, 2015. Retrieved November 13, 2015. ^ "DVD Promo Site islaTravel.com Opens". DansJP3Page.com. November 27, 2001. Archived from the original on February 3, 2002. ^ a b Hettrick, Scott (November 28, 2001). "Dinos phone in video promotion". Variety. Retrieved November 13, 2015. ^ "Universal Studios Home Video and Hop-On Introduce the World's First Disposable, Fully Recyclable Cell Phone: The Jurassic Park Survival Cell Phone". Hop-On.com. November 29, 2001. Archived from the original on June 3, 2002. ^ a b c Wagner, Holly J. (June 7, 2002). "Jurassic Park III Survival Phone Promo Is Extinct". Home Media Magazine. Archived from the original on November 17, 2015. Retrieved November 13, 2015. ^ a b Wallack, Todd (March 29, 2002). "Sample 'new' cell phone really just modified Nokia". San Francisco Chronicle. Retrieved November 13, 2015.